Next day was the couple's Muslim Ceremony followed by Reception. 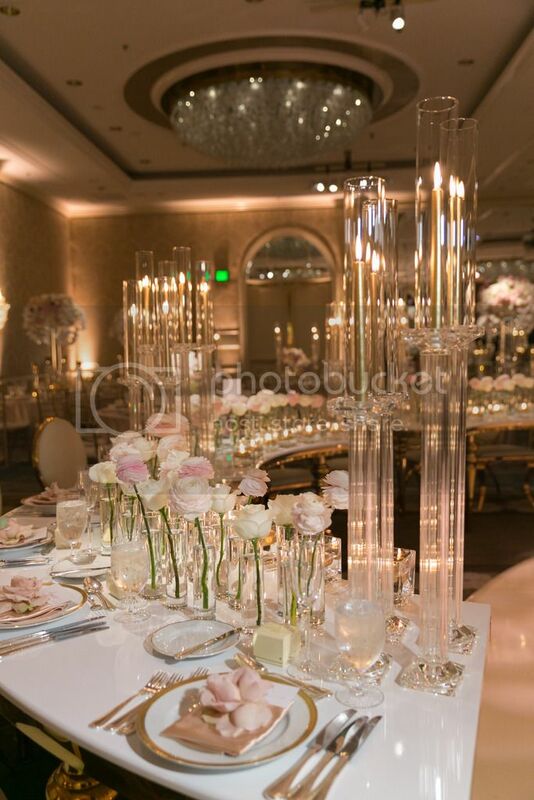 She wanted something simple and ethereal for ceremony set up on the lawn and no heavy flowers. 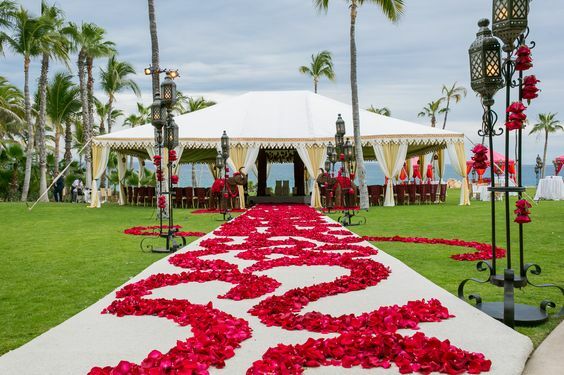 Entrance to the aisle was dramatic with two very large arrangements and the aisle had a thick carpet of rose petals. The raised area had a few pieces of furniture with same style of flowers. Guests from both sides took over the library and front lobby for the procession and bride's family awaited to welcome back on the lawn. Dhol player's sound was an indication that groom's procession was about to come out for ceremony. There was a lot of dancing before they made their way up to the altar. Bride came out looking radiant in her father's arms and walked down on the tune of Halo which was being played on sitar. After the short ceremony, guests made their way to Wetherly Terrace for cocktails and couple went up on roof top for some photos. 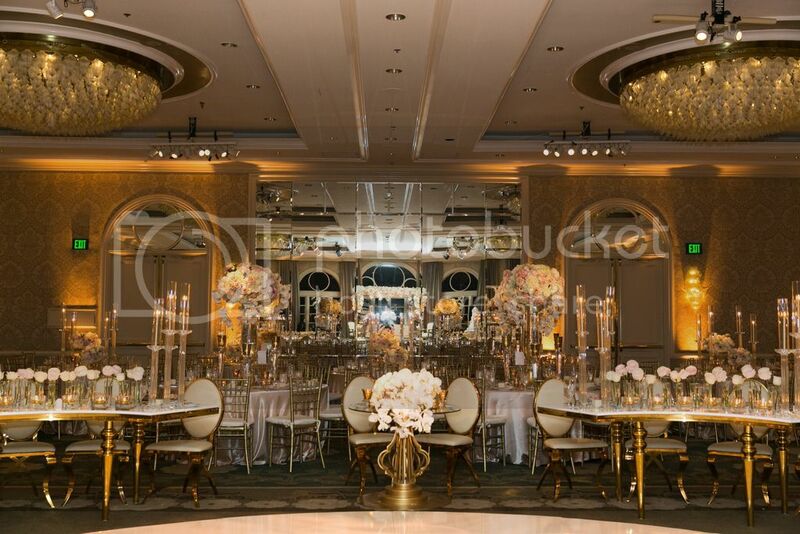 Ballroom was bathed in sea of pink and gold lighting. 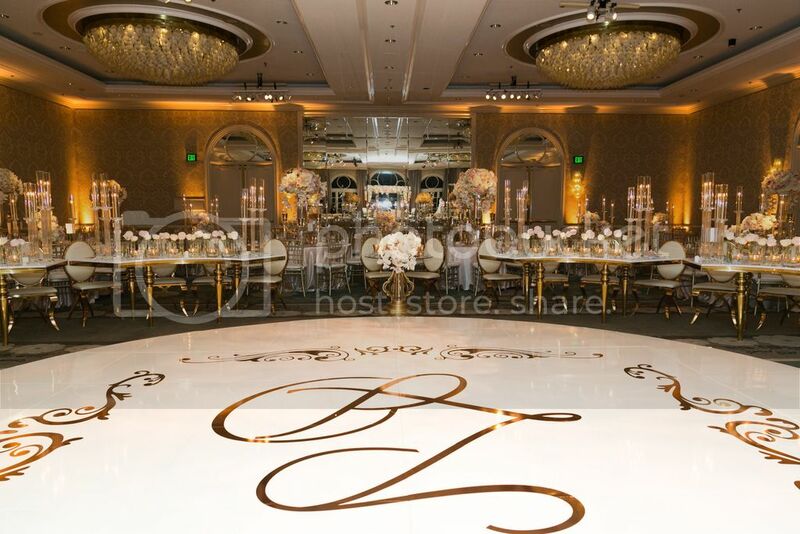 Rose gold, gold and champagne colors were mixed and the curved tables around the dance floor looked elegant. 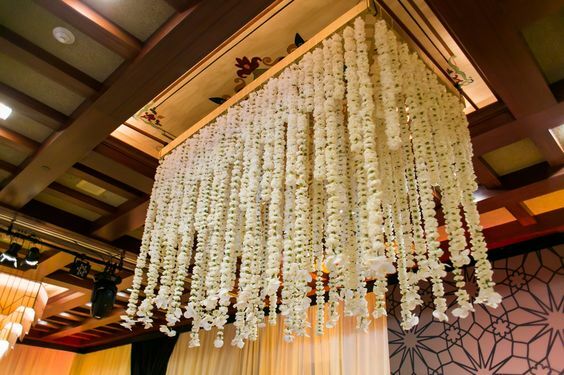 Stage was per bride's inspiration with a simple backdrop of flowers cascading down. 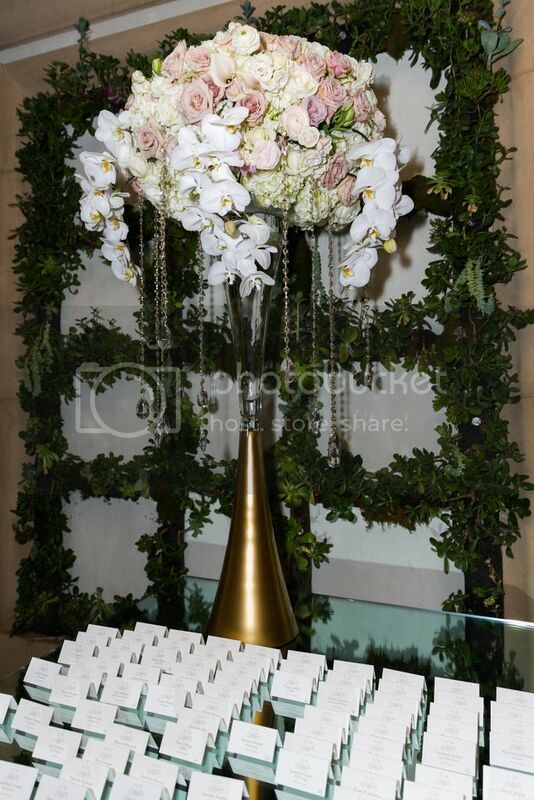 Period furniture added to the charm and end tables and consoles on either side of the stage were decked with flowers. 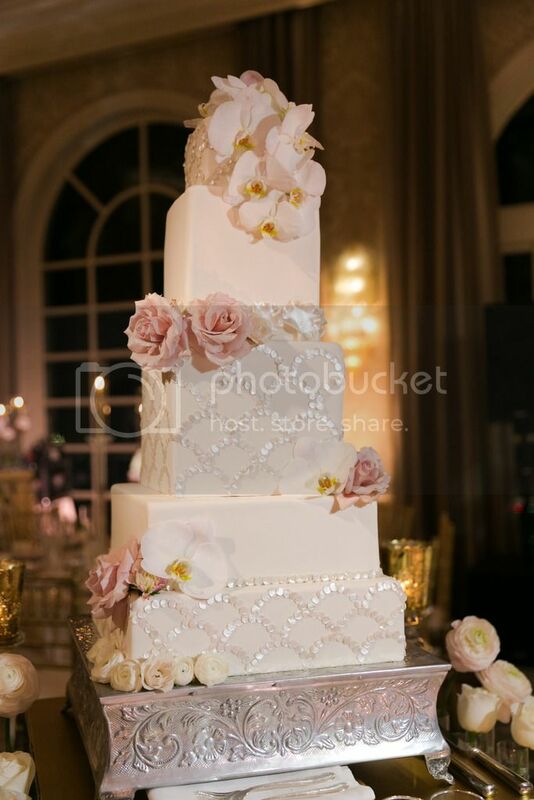 Pastry chef at Four Seasons did a fantastic job of copying bride's embroidery on the cake which was breath taking. Couple made their entrance amidst noise from a lot of their friends and first dance was on cheap thrills which brought the guests on their feet. Bride's father thanked everyone and in between courses, more speeches, dancing, entertainment the dance floor was open to invite guests. In no time there was no room on the dance floor and guests did not let that get in their way so they danced on the carpet by their tables. The joyful and memorable night came to an end with guests looking forward to the next day farewell brunch. LOS ANGELES – Exquisite Events joins forces with Braja Mandala Photography to create The Bespoke Guide, a bi-yearly publication on fashion, trends, and Indian wedding traditions. The first issue is available to view online at http://www.exquisevents.com/blog/?p=10153&preview=true. It will be available to purchase in the upcoming weeks. 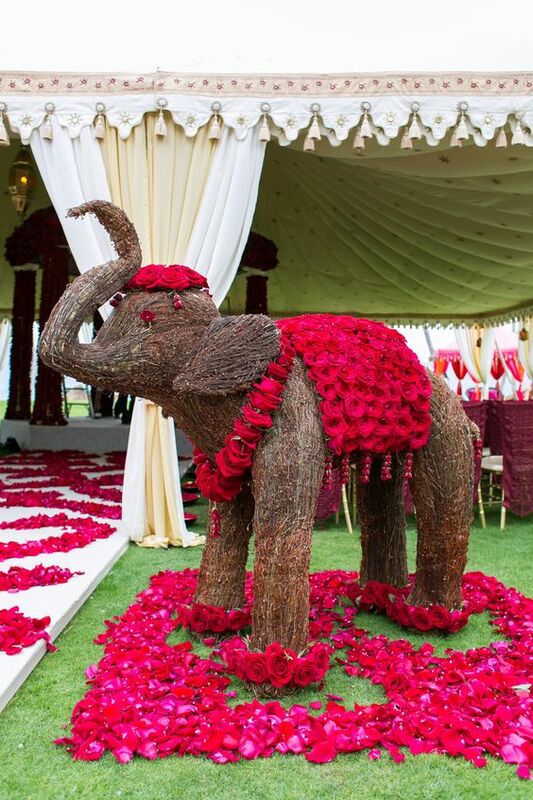 With a true love of designing and planning luxury events, Exquisite Events created The Bespoke Guide with the innate desire to share, educate and inspire Indian traditions and customs with brides, venues, planners, and industry professionals. 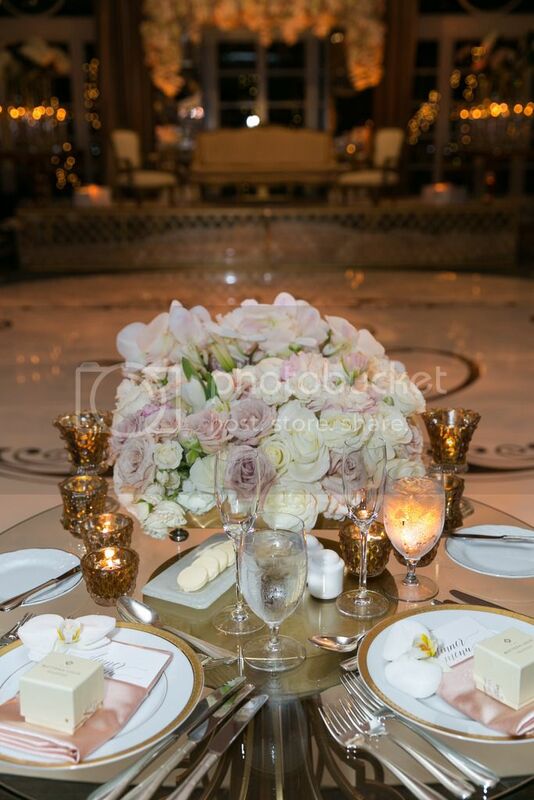 All events featured are produced by Exquistite Events and photographed by Braja Mandala. This issue gives an insight to the ladies behind Exquisite Events, Nikki & Madiha Khan, as well as showcasing the photographic journey with Braja Mandala. There is a look into an engagement party, Pithi party, Mehndi, Sangeet party, Milni, Baraat, Wedding, Vidai, and receptions. 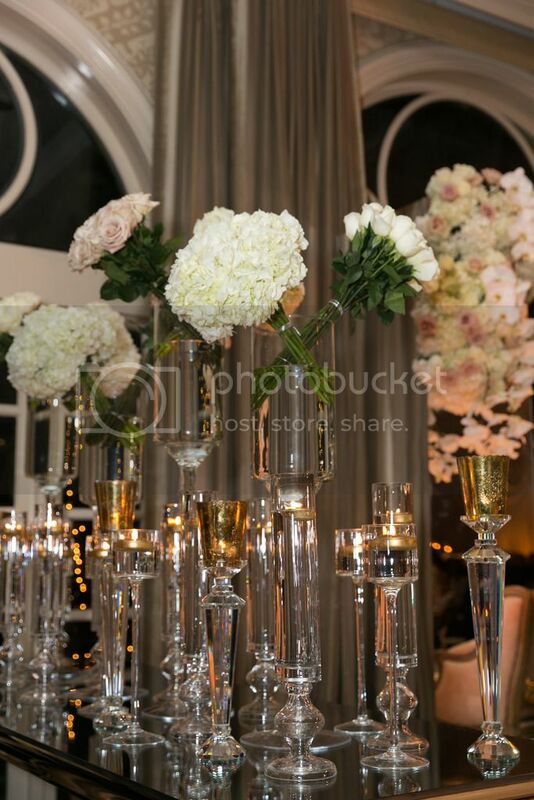 The beautiful photos capture personalities, special moments and decor details throughout the events. Royal elegance is showcased in the fashion photo spread at Four Seasons Hotel Los Angeles featuring bridal couture from Yasmin Boutique. 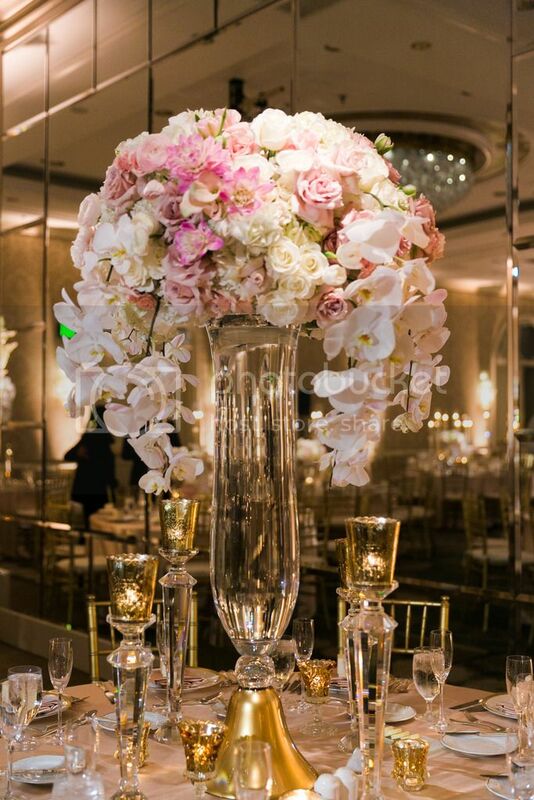 For more information on The Bespoke Guide, event planning services, and photography, please contact Madiha Khan at Exquisite Events. 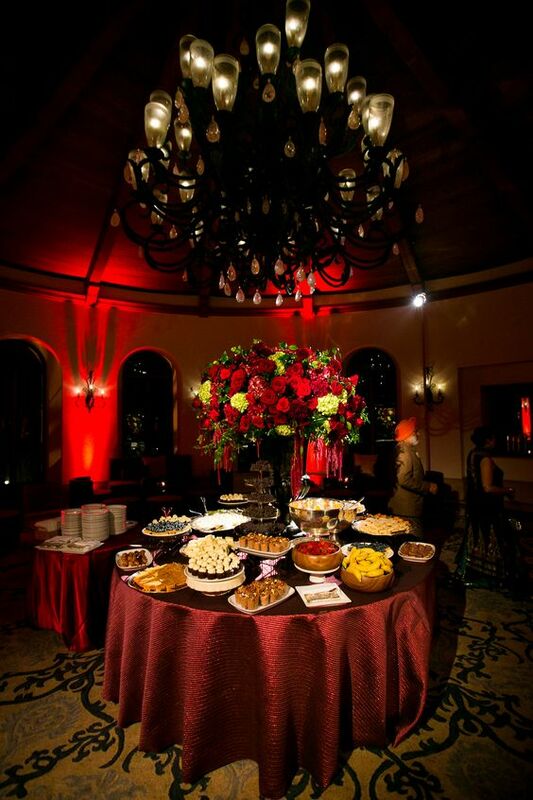 Exquisite Events is a full-scale event design and planning company based in Los Angeles producing weddings, gala affairs, and specialty events worldwide. 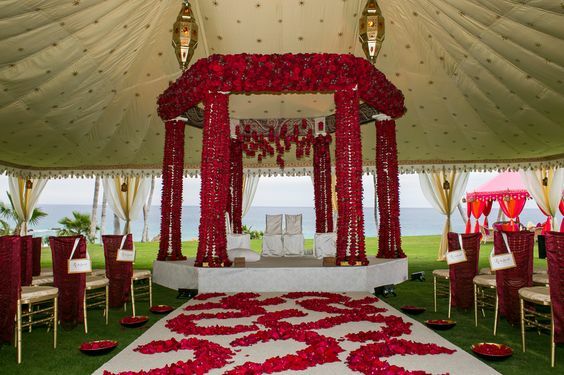 The company was founded and started by Nikki Khan who has been in the event planning industry for over fifteen years. 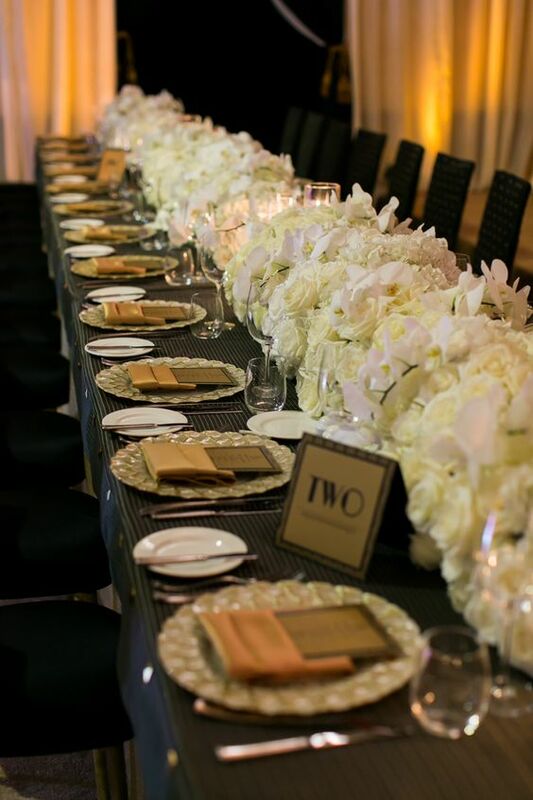 From intimate sit-down dinners to grand ballroom weddings, Exquisite Events is committed to producing a memorable and immaculate occasion for you and your guests. The experience and professionalism has been given praise from their growling list of clientele, while the beauty of their work has found recognition in numerous publications including Harper’s Bazaar India, Inside Weddings, Hello! Magazine, Tatler Philippines, Luxury Wedding & Style Russia, and Grace Ormonde, to name a few. Recently named as “One of the Top 100 Inspirational People” by The Knot Magazine Braja Mandala travels the globe photographing weddings. From far away destinations such as India and Australia to destinations from coast to coast in the United States. Braja’s roots in the Hindu religion was the deciding factor to specialize in Indian weddings. Understanding the traditions and meanings behind the ceremonies is a major asset to getting the best images for her clients. Braja’s work can be seen in many national and international publications. Our bride Zara was a referral from a past client and it was a pleasure to work with her. Her family is originally from Lahore, Pakistan and there was an immediate connection as Nikki happens to be from that city as well. Zara wanted her mehndi to be super colorful and indicated hot pink to be her favorite color for this event. 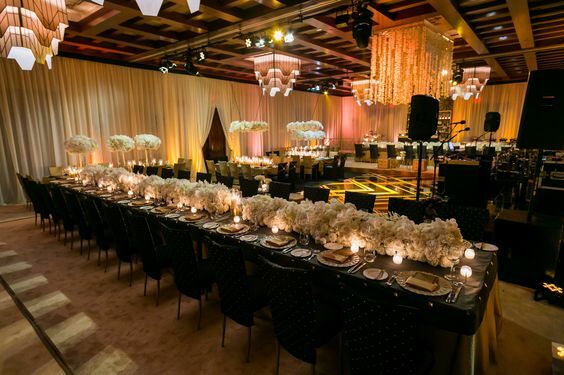 After searching on a few venues the couple decided on Casa Del Mar in Santa Monica as they wanted a very California beach vibe for their out of town guests. 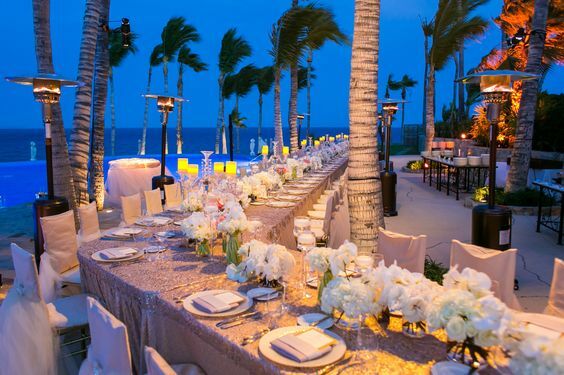 It was a destination wedding as bride's family is from Pittsberg and groom's family is from San Francisco and Casa del Mar provided that perfect backdrop for the guests. There were about 270 guests in attendance and they were all in the mood to party and have a good time. Groom's family arrived with show and pomp carrying decorated mehndi trays, sweets and gifts for the bride and settled in the Board Room. In the meantime the bride's side was practicing their specially prepared dances to beat the groom's family in competition. 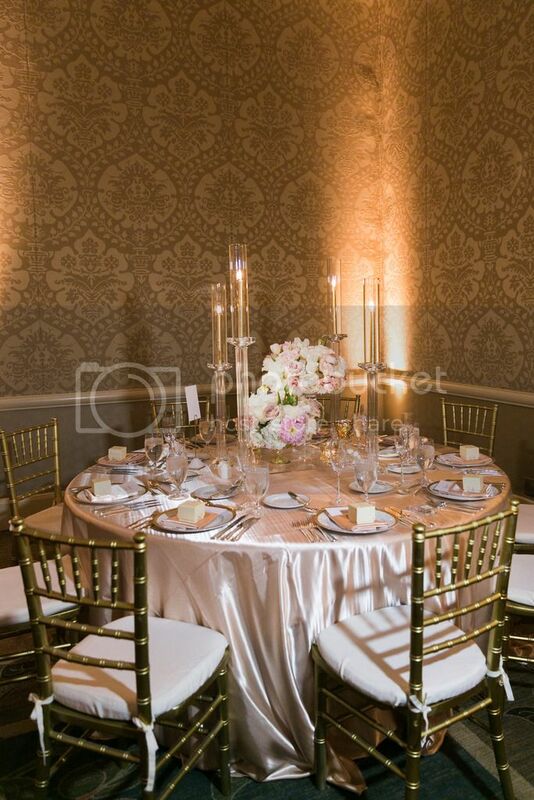 Ballroom looked very traditional with marigold back drop and stage furniture. Dance floor was hot pink with a gold mehndi pattern and lanterns in varying heights were placed all over the edge of dance floor and stage to add more drama. 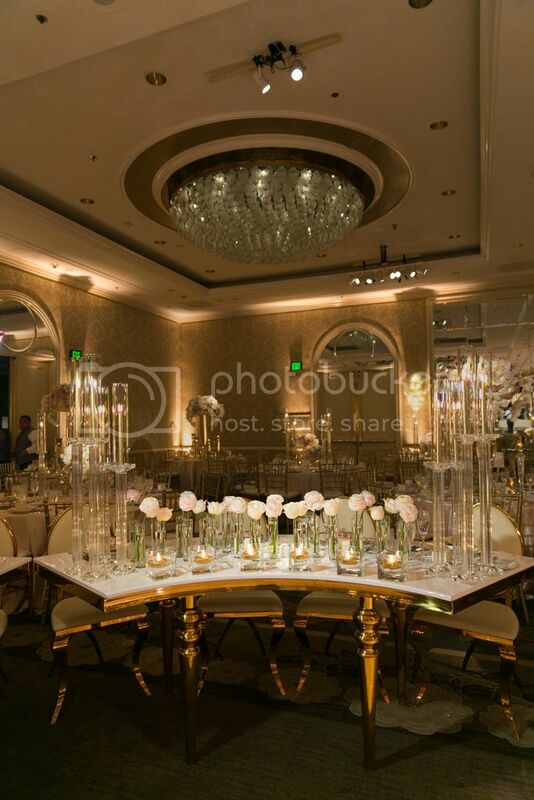 Low furniture vignettes in pink and gold bearing lots of candles and rose petals were all over the dance floor and the room and round tables and chairs were placed strategically behind the columns. Amber and pink lighting further enhanced the drama and flair. 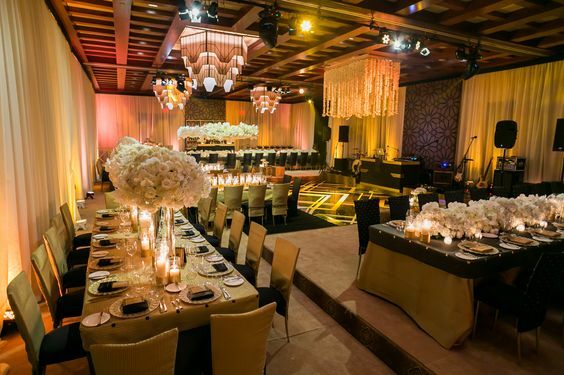 Our couple entered the room before guests arrived and were completely floored with the transformation of the space. Needless to say when we see that, our hearts just melt and all the long hours and hard work that goes in to the execution of these events is so worth it. Shortly after the guests entered the ballroom, groom's family made their entrance with a lot of dancing. Then the bride's family made their entrance with bride walking among her cousins and brothers. Some traditions of henna took place on the stage and the dance floor was opened soon after guests got to nosh on delicious buffet. After some skits, choreographed dances from both sides and more dancing the night came to an end at 12 am. Due to her love of afternoon English tea, Nikki decided to turn her dining table into an English inspiration. Atop an English floral table runner was her Royal Doulton dinner set in navy blue, white, and gold along with St. Louis crystal stemware. 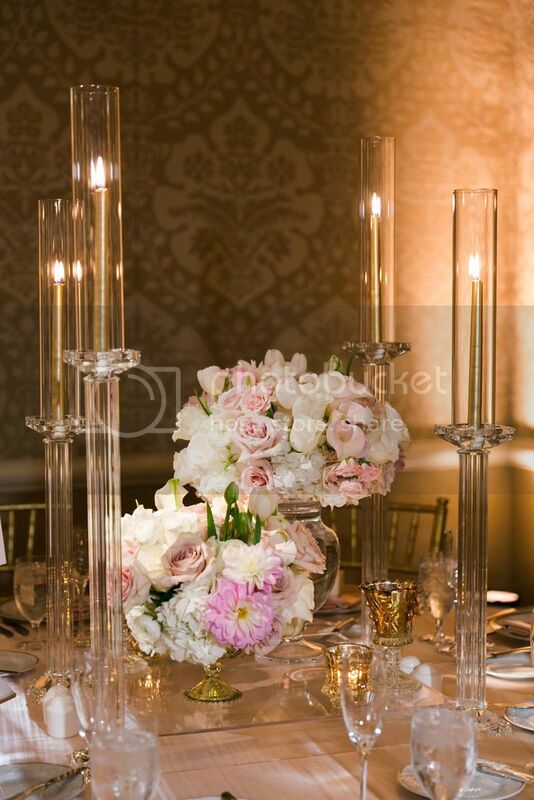 The candlesticks were all finds from a flea market in London. 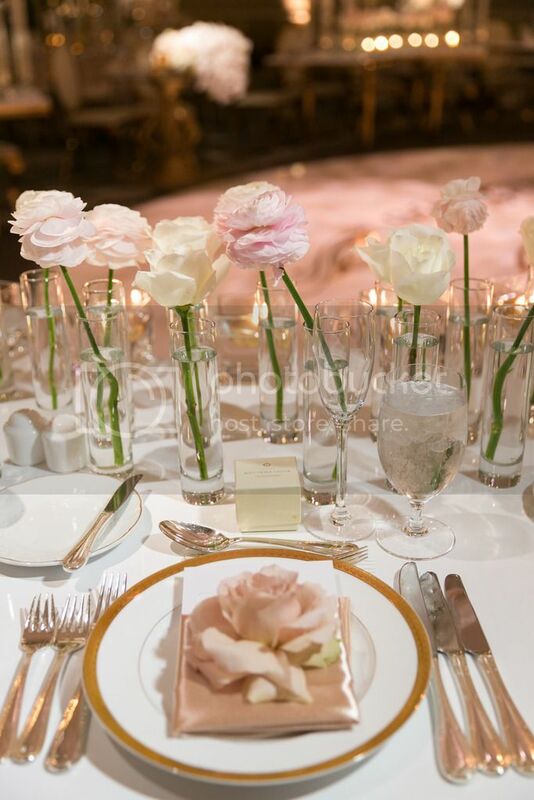 White Russians linen, mats, and napkins enhanced the place setting along with garden roses in pink. The flowers consisted of peonies, garden roses, daisies, and English ivy- altogether which provided a lot of texture and interest.